He is not a role model. As my friends, family and co-workers can tell you, I'm a big movie fan. I love all types of movies - from silent era to what came out on Demand yesterday. Maybe that's because I fashion myself a storyteller. Or maybe it's because I think visually. Or just maybe it's because I like to sit on the couch and magically spill salsa on my shirt within four minutes of turning on some forgotten film noir from 1954. Whatever the reason - I love me some movies. And as a professional B2B salesperson, I've loved sales movies most of all. Sure I love the classics like Death of a Salesman with Fredric March but also modern-ish films like Glengarry Glen Ross, Boiler Room, Wolf of Wall Street, et al. I can watch them over and over again. Evidence of that lies with people like Lief Rasmussen, Phil Dixon and Patrick Purcellwho can attest that I have memorized Alec Baldwin's speech in Glengarry Glen Ross and can quote it - verbatim - when asked. Or not asked, as was more often the case. That's how much I like sales movies. And I know I'm not alone. Everywhere two or more sales people gather together, these movies (and most importantly quotes from these movies) are ubiquitous as fishbowls of business cards in steakhouses. 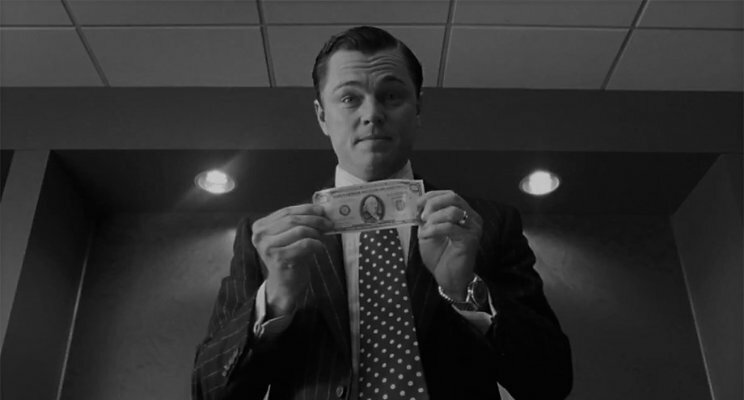 Because whether it be Pacino's Roma talking about train compartments or DiCarpio's Jordan Belfort selling pens, I believe, many professional salespeople are awed by the act that these films portray - the act of speaking persuasively to convince someone else to give them money. Why? Because sales is hard. Because sales is rough and tumble - it's us vs. the prospects. It's kill or be killed. It's sell today or you don't eat. It's Type-A. It's Alpha in the pack. It's top of the board and everyone else. It takes a special kind of person to sell. It's winners and losers. And these guys (yes, almost all guys) in these movies personified the GRIT it takes to get sales done! If you can't do what they do, you're scared. You're lazy, You're weak. At least that's what I used to think. Until I realized Willie Nelson was wrong - my heroes weren't cowboys...they were criminals. At least that's how most sane people saw them. Sane people like my prospects and customers and employees. It was a little after Wolf of Wall Street was released and I was having a conversation with a family member. We were talking about this and that and I was asked if I saw the movie. I said yes and proceeded to talk about the Sales Pitch scene. Weaving the story, quoting the dialog and giving my opinion about how it was brilliant the writing was and how it spoke to me in as someone who spent a career in B2B sales. This is when my family member said "Well you don't do that do you?" Taken about, I pushed through the shock, lifted my jaw off the floor and said "What?" "You don't rob people like he did, do you?" "I'm not a criminal," I stammered, barely controlling my incredulity, "I am a salesperson!" "Well, how could you relate to him if you're aren't?" Mic Drop. Now you may be thinking, Well, thanks for being a Debbie Downer, Mr. "I'm too good for sales movies now." Get a sense of humor, it's just a movie. No one thinks these guys are role models. Really? I don't know about you - but I've been to enough sales meetings and enough trade shows and enough sales conferences to say this: these movies may just be movies - but many people in B2B sales look to these characters as role models. Tell me you've never heard someone say "Always Be Closing" and mean it, un-ironically. Tell me you've never been to a team-building event or sales appreciation dinner and didn't hear Boiler Room references tossed around like rice at a wedding? Tell me people in your circle of sales bros didn't start pounding their chests. What do you call a person you quote, you emulate, you craft your own persona to be like? I think that's called a "Hero." And, no, not the sandwich. True Confession: I have had a framed mini-movie poster of Glengarry Glen Ross in whatever office or cubicle I was provided since 2000. It was a gift from a friend. Since I now have a home office it hangs on a wall perpendicular to a school picture of my daughter. All those years I brought clients to my office - they saw that poster. What did they think? Were they listening to me when I talked about how I was there to provide them insight and be a true and valuable partner? Or were they thinking of a pack of sales-jackals ready to say anything to get a sale? What did the salespeople I managed think of me, with all my "customer comes first" and "provide real intrinsic value" and "listen more talk less" coaching? Did they sit there in my office believing me? Or did they look at that poster and hear Al Pacino berate Kevin Spacey for not knowing which lie to tell the customer? "We are who we pretend to be - so be careful who you pretend to be." I had to ask myself: Who was I pretending to be? This isn't meant to be a preachy post - and if it is, I apologize. I'm not here to tell people what to do. I can only tell you what I do and don't do. I still watch my movies. I still think I have a sense of humor about sales. I still love the dialog in sales movies - as you can see I even linked to those scenes in this post. I don't emulate any of that behavior. I don't hold these guys up as examples. Ricky Roma isn't a hero. He's a liar. A crook. The cop in that movie should have thrown him and everyone else in that movie in jail. Mitch and Murray too. The only good guy in Wolf of Wall Street is the cop. End of story. Seth in Boiler Room? Yeah, he should have went to jail too, along with everyone else. I said in another post that if you wanted to know what people valued, look where they spend their money. Here's a new one - if you want to know what people believe, look at their heroes. I'm looking for better heroes. And if you're wondering why the poster still hangs in my home office - yes I considered taking it down. I thought about it allot. But I keep it on the wall. Why? It hangs as a reminder. A reminder of the day I had to say the words, "I am not a criminal."